You’ve got things to do and places to be in Winnipeg. Now you just need a car to get around. That’s where we can help. At LowestRates.ca, it’s easy for Winnipeg drivers to get approved for an auto loan and get on the road — even with bad credit or no credit at all. Our application takes just minutes to complete. Bad credit or no credit? We can still get you a loan. Get approved for a loan ranging from $5,000 to $40,000. Access to competitive rates in Winnipeg. You don’t pay a cent to apply or get approved. What information do you require to start my car loan application? Just tell us the basics: your age, where you live, and some employment details. Our application form is easy to understand and we don’t ask for your social insurance number or personal references. You need a minimum monthly income of $1,500 — that’s one of the most important qualifiers. You also need to be a Canadian resident and have a valid driver’s license. I don’t have any credit history. Can I still get a car loan? Yes, definitely. We specialize in car loans for Canadians with poor credit or no credit at all. We can get you auto financing even if you’re new to Winnipeg or haven’t started building your credit history. How does your car loan service work? We match you with a lender or dealer in your area with special expertise in bad credit car loans. Which Winnipeg dealers does LowestRates.ca work with? We work with an exclusive network of licensed Winnipeg dealers. These dealers specialize in car loans for consumers with bad credit or no credit, and they’re located throughout the city. So whether you live downtown, in River Heights, or in another Winnipeg neighbourhood, we’ll be able to match you with a dealer nearby. Your rate is usually based on factors like your credit score, income level, loan amount, and employment history. When you’re matched with a dealer, ask for more details and see if the rate is negotiable. How much sales tax do I have to pay on a vehicle purchased in Winnipeg? 5% GST (Goods and Services Tax) and 8% RST (Retail Sales Tax). Both rates apply to new and used car purchases. Should I choose a short car loan or a long car loan? That depends on the size of the monthly payments you can afford. If your budget can’t handle large monthly payments, you should go with a long car loan, usually defined as over 5 years (60 months). If your budget can handle bigger payments, a short loan is the smartest choice — you’ll save on interest and eliminate your car loan debt in less time. 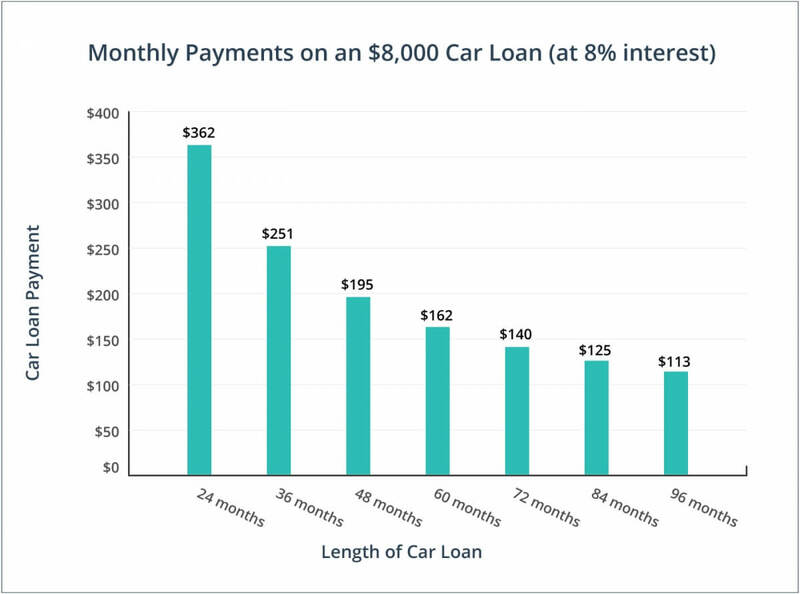 Check our graph to see how your monthly payments rise or fall depending on the length of your car loan term. Your car buying budget might be bigger or smaller than you expected. That’s why it’s smart to get qualified for a car loan before you start shopping for your car. Think about the big-picture costs associated with your car loan before you buy. For example, how much interest will you end up paying on a shorter loan versus on a longer loan? Dealers must disclose a car’s history to the buyer before completing the sale. For example, the dealer has to tell you if the car you’re buying was ever damaged in an accident or used as a taxi, limo, or emergency vehicle. The car you’re interested in may be on Manitoba’s “Most-at-Risk” list, which means it’s considered to be at least twice as likely to be stolen as the average vehicle. Check the Manitoba Public Insurance website to see if your car made the list. I won’t be eligible for an auto loan if I’ve already been turned down by my bank. False. We can get you a loan even if you have bad credit and can’t get financing from a bank or credit union. As long as you meet our minimum car loan requirements, it’s no problem. I can use my new car loan to refinance my current car. False. Our auto loans can only be used to purchase a car, not to refinance a car you’re already paying for. “Most-at-Risk” vehicles always come with immobilizers. False. Car dealerships can sell Most-at-Risk vehicles without immobilizers. By law, the dealer just has to tell you if the vehicle is on the Government of Manitoba Approved Theft Deterrent Immobilizer Regulation list and let you know if the vehicle has an approved immobilizer. If it doesn’t, you’ll have to buy one on your own. 2015 was another record-breaking year for car sales. According to Stats Canada, 57,971 new vehicles were sold in Manitoba, and around half of those sales were in Winnipeg. There’s no denying that Winnipeg is a community of drivers, especially when the stats back it up: 71% of Winnipeg residents drive to their jobs. As of June 2015, registered car dealers in Winnipeg (and the rest of Manitoba) are required to use all-in pricing for their advertisements. That means the price you see is the price you pay, minus the sales tax.